On Saturday 24th November we will be having a protest against the siege of Gaza and UK complicity in Israel’s violations of Palestinian human rights starting. It will start at 12:00 in Piccadilly Gardens. The siege of Gaza and the regular Israeli military attacks have continued now for more than 10 years. Since March 30th Palestinians have been protesting against the inhumane conditions created by Israels illegal blockade, and to reaffirm their right as refugees to return to their homes, a right that is enshrined in international refugee law. 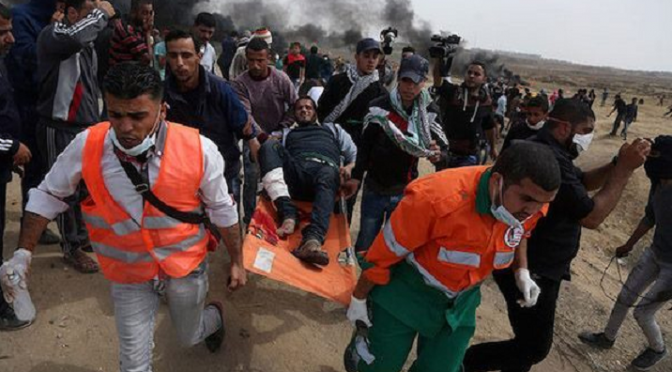 Despite the protests being largely peaceful in nature, Israel has used lethal force including against medics, humanitarian workers, press, and children. Israeli forces have killed over 200 Palestinians in the Gaza Strip and injured more than 18,000. The UK is complicit in Israel’s violations of Palestinian human rights through our arms trade. Despite the illegality of Israel’s occupation and apartheid system, the UK is one of the main arms exporters to Israel as well as a major purchaser of Israeli weapons and weapon technology. The chain of complicity extends to our high streets as UK banks, including HSBC and Barclays, are heavily involved with arms industry and international trade.